Each product in the Makiko pendant series is crafted organically, meaning that no two appear the same. The satin black wire frames are hand-welded, resulting in a modern, monochromatic effect as light is cast. 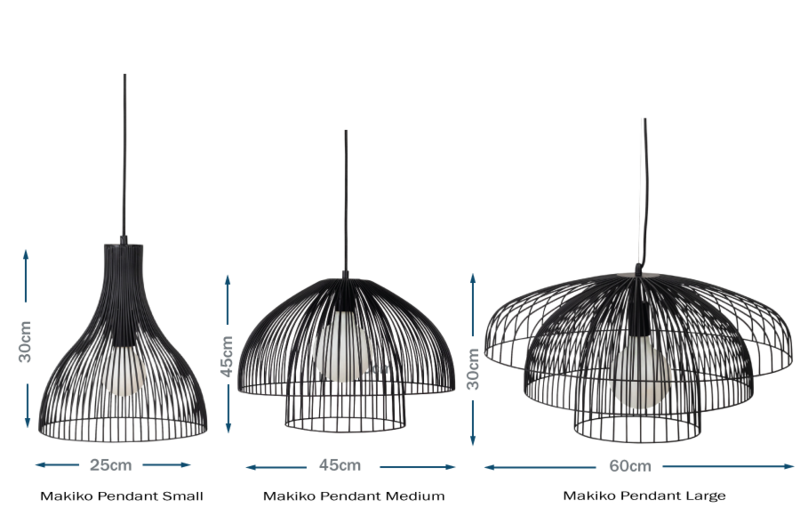 Artistic in design, the silhouettes of each pendant echo traditional Japanese panelling. Subtle and elegant as a single pendant, or dramatic as a set, Makiko uses the essence of simple yet flawless design to play with shapes and light. Pair with an opal bulb for a gentler ambience, or an exposed filament bulb or a more pronounced effect. The black wire frames with a satin finish are inspired by Japanese design. Each pendant is organically hand-welded.